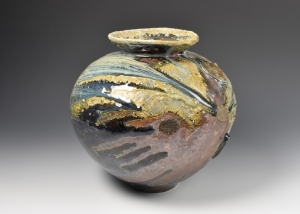 Matthew Blakely is a distinguished and internationally known potter. Best known, perhaps, for his knowledge of how glazes are made and fired. He makes ceramic pieces that are entirely created from rocks and minerals that he collects from all over the UK. Day 1: Students bring your own clay and rock samples. Prepare clay tests – crushing, sieve, plasticity, shrinkage bars etc. All to be dried out for firing in electric test kiln to 1100c next day. Rock tests – preparation, melt tests and simple line blends. Then class line blends and demonstration of quadraxial blending. All samples ready for firing in gas kiln next day. Day 2: Glaze technology lecture. Then fossicking and collection of local material, in field analysis of suitability. Day 3: Geology basics. Rock types and practical and legal considerations about collecting. Open Kilns and analysis of results. Use result to illustrate glaze theory with found materials. Future directions and preparing tests of found materials for people to take away with them and fire in their own kilns. Whilst there is a considerable theory element in Matthew’s glaze classes, he tries to keep it simple and logical and interspersed with practical making to break it up and demonstrate the theory. Be prepared to head out onto Dartmoor and collect materials for future testing under his expert guidance.